Some people are asking which platform they should use. Some are asking whether they should have multiple domains. Others are asking about the difference between subdomains and subdirectories. It is a big question with lots of history, so I decided it deserves it’s own blog post. When I started looking at the history of blogs to brush up for this post, I couldn’t help but feel old. I started using the internet around the same time blogs started showing up on the internet. Somewhere between 1999 and 2001, “blogs” or “weblogs” started to become a popular way to share information online. They became especially popular with news sites, and some of the earliest successful blogs followed politics and sports. In the early 2000’s several blog platforms popped up, including blogger and WordPress. At that time, most people had websites that were set up manually using static code like HTML. Of course some bigger sites may have been using dynamically generated content on a custom database, but the average website owner wouldn’t have the knowledge to set something like that up on their own. Also in the mid 2000’s, Flash gained lots of popularity and was especially popular with photographers. Generating dynamic content from a database on a Flash site was extremely difficult. In fact, the average website owner probably started with a Flash template and had no idea how to actually modify the code. Because of the technical difficulty of creating and maintaining databases, most people who had a blog kept it completely separate from their website. In the photography industry, it was popular to see a photographer with a blog on blogger and a flash site on their own domain. The technology issues with Flash (some sites needed to be viewed in specific monitor sizes, or have a specific browser), and the need for multiple websites is also what started the rise of “splash pages.” Photographers would set up a page on the root of the domain that allowed people to decide whether to enter the website or visit the blog, and they would often warn about any technology issues. I still see a surprisingly high number of these splash pages on photographers sites in 2016, even when they are not necessarily needed. At some point closer to the end of the decade, the self hosted WordPress platform started to become more popular and was a legitimate option even for the DIY webmaster. Even then, many photographers considered this to only be a replacement of the blog they had on a 3rd party platform, so they maintained their flash site and their new self hosted WordPress blog on separate domains. Fast forward a few more years and all of the sudden WordPress basically takes over the internet (in 2016, WordPress powers over 20% of the internet). The capabilities are endless, themes are available to do pretty much anything you can imagine, thousands of plugins allow specific and advanced functionality that would have previously cost thousands of dollars to develop. Not to mention the platform and many plugins/themes are FREE. ProPhoto (the theme) entered the market and was incredibly well received by photographers. ProPhoto did an excellent job at making WordPress easy, even if you weren’t a web developer. They were also smart about niching down and focusing specifically on the needs of photographers. Even ProPhoto marketed themselves as a way for photographers to make their “blog” and not their “website” (at least in the beginning). I can still remember when a few big name photographers (anyone remember Jessica Claire?) started using their blog as their main website and ditching everything else. Photographers thought they were crazy. Even those websites (people commonly called them “blogsites” and some still do) still “looked like blogs” and usually had the posts on their home page. However, over the next few years it became increasingly popular to just use WordPress to create ALL the pages of your website. 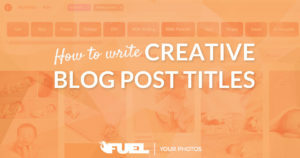 ProPhoto dropped “blogs” from their name and did a good job keeping up with the mobile friendly trend that was happening. Big name designers started specializing in designs made specifically for ProPhoto, and started to do some really cool things with the WordPress platform that helped the sites stop “looking like blogs.” Several other themes became popular with photographers as well. At the turn of the decade, handheld devices start becoming more and more popular, and responsive design becomes a “thing.” This created a whole new challenge in making sure content is displayed properly across devices, whether it is a blog post or a gallery. It also created a whole new barrier for photographers who don’t necessarily know enough about web design to figure out how to set up a responsive website and blog. Even up until 2015, there were very few options that allowed photographers to build responsive websites that included blogs without having much technical experience. Squarespace became massively popular with photographers because it allowed all of these things. Today, we finally have some great options back on the market, but many photographers still haven’t adopted them. I still see a large number of photographers on non-responsive sites (some are still BUILDING these sites!!) and I still see quite a few photographers using old/outdated platforms that really aren’t serving them well. In 2016, I strongly believe that a “blog” and a “website” should not be two separate entities. ****The one exception is if you are sure you want to have your site on one of the 3rd party blogging platforms available. For example, both Medium and Tumblr are very popular in some circles right now, and you could potentially gain some social benefit from using one of these platforms for your blog. Some people might even choose to have their “blog” be on their Facebook Page, especially with the capabilities of the new FB notes. For 99% of photographers I don’t personally recommend any of these options, but if you know what you are doing, I’m not saying it would be wrong. Is there a difference between a website and a blog? Sometimes the terminology gets kinda confusing. Blog posts, pages, archives, media attachment pages; all of these are “webpages.” If it has it’s own URL and content, it is a web page. It is useful to distinguish between posts and pages when deciding where to put your content, but when it comes to the technical definition, and when it comes to SEO, they are all (pretty much) the same. 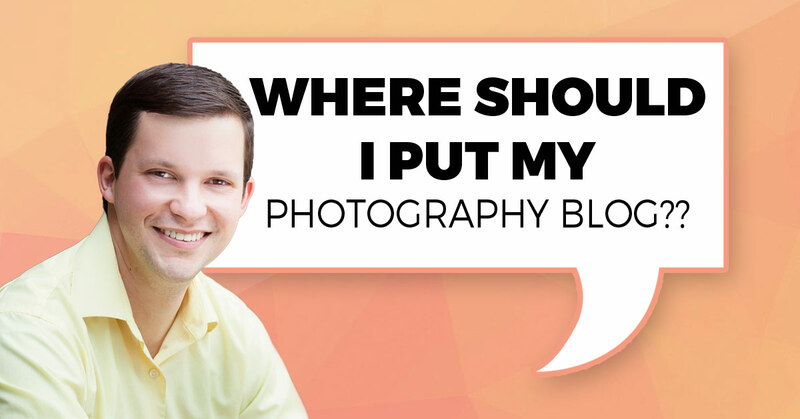 Many of the best photography websites use blog content to generate their pages. It is so easy to just show people your most recent work by listing the most recent blog posts in a specific category. Want to create a page about testimonials? Just start blogging each testimonial then create a page that pulls the posts from that category. You could even create a portfolio gallery by pulling the featured image from each of your blog posts. Every platform will handle the creation of these pages differently, and they will often have their own naming convention for types of webpages. Whatever platform you are using for your website should allow you to create pages, galleries, forms, posts, and anything else you need within the same system and on the same platform. As of 2016, there are 3 main contenders when it comes to photography website platforms. I won’t go into depth comparing these platforms in this post, but I will talk about where you should put your blog. First, since we have already established that a website and blog should not be on different platforms, it automatically follows that they should be on the same domain. One of the most common things I see is photographers who have something like “myphotography.com” and “myphotographyblog.com.” This is one of the worst things you can do, not only for SEO, but also for user experience. 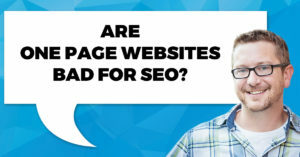 In SEO, the reputation and authority of your website is heavily based on your domain. You may hear people talking about domain authority, which is a score MOZ gives to a domain out of 100. This score takes many factors into consideration. Things like your backlink profile, your site age, trust, keyword usage, and spam score are all used to calculate domain authority. MOZ designed their domain authority score to have an extremely high correlation with Google ranking. The higher your DA, the higher you will rank in a Google search. It isn’t a perfect correlation, but I’ve found it to be fairly accurate in general. When you have two domains, you are splitting your domain authority. Each domain will need it’s own unique content, it’s own backlinks, and will need to establish it’s own reputation. Often, if you just combined all of these factors into one domain, your domain authority would be considerably higher than it was for either of the domains on their own. It is significantly better for SEO to have one site with a domain authority of 30 than two sites with domain authorities of 15 each*. ****Note: combining your two DA 15 sites will usually not result in one DA 30 site. The score is logarithmic, which means that each number is harder to reach than the previous number. You’ll also usually be combining at least some duplicate links and content, which wouldn’t count twice. So now that we’ve decided to put all of our content on one platform and one domain, the final question I want to address is whether it is better to use a sub-domain or a sub-directory. This question usually only comes up for one of two reasons. Either you are making a big move across platforms and it is easier to use a specific method, OR, you’re a Showiteer. Showit will frequently set up your blog on a subdomain instead of a subdirectory. There are two main reasons I still believe a sub-directory is significantly better than a sub-domain. 1. Because it creates a better user experience. Even if your design and navigation is exactly the same on both, I think having a user switch domains (even subdomains) presents a choppy user experience. If I want to go to the about page, it is usually domain/about. The contact page is usually domain/contact. If I’m the user, I expect the blog to be a page on your site, and I expect it to be at domain/blog. This goes back to the mindset that I talked about earlier. Your blog and your website are not separate entities, so why would you treat them like they are on the user end? The blog should be a natural part of the site as a whole, and a subdomain makes it feel like it is a separate entity that is split off from the site. I also prefer nice and consistent permalinks throughout my site. I think having a subdomain can get confusing, especially with links that get shared. Should you use a www? Is it www.blog.yourdomain.com or just blog.yourdomain.com? Too many dots. Because I’m a WordPress user, I can have a page or a post with indistinguishable URL’s. Again, it makes my site look like one entity. mysite.com/post-1 and mysite.com/page-1 can have different functionality and organization structure, but still have nice consistent URLs for the user. 2. Because Rand Fishkin, and several other highly trusted SEOs say they’ve tested and believe that the sub-directory is still superior when it comes to ranking. It is extremely hard to do a fully accurate test on something like this, and even the best tests can have flaws. However, I really trust that these guys know what they are talking about, and I personally tend to agree with their findings. Even if they are only correlations. I don’t just blindly follow everything posted by Moz, and I say you are “wrong” for disagreeing. This is just my opinion of how things work right now, and as search engines continue to favor user experience, my prediction is that this will continue to be the case. Still disagree? You might have a specific case where a subdomain is better for your site. You might even have a situation where you should use multiple domains. I’ve advised people to do both in specific situations. BUT, if you are part of the majority, probably 99% of photography websites owners, the answer is simple. Your blog should be in a sub-directory of your site on the same domain with any other content. I’d love to hear any follow up questions you have about the topic, so leave a comment below and I’ll update this post with a FAQ section! Thanks for the great info!!! You answered a lot of my blog questions! Thanks Corey, Great article! Very helpful. A follow-up question…..for a while now it seems that more and more photographers have gone from a “linear” blog format (a single post on the blog home page followed by the next oldest post and so on) to an “aggregate,” format, with multiple post links to choose from on the main blog page. Any recommendations there?